With Christmas just weeks away and family coming in and out of town over the next month, I really, really wanted to get our guest bedroom in order. In fact, I meant to get it done when we had all our friends in Atlanta back in October, but I ran out of time. Story of my life. As you can gather from the before photos, the guest bedroom didn’t have much going on initially. We’d typically leave it an empty space, aside from Jeff’s computer desk, when guests weren’t in town, because we never really could figure out what to do with it. 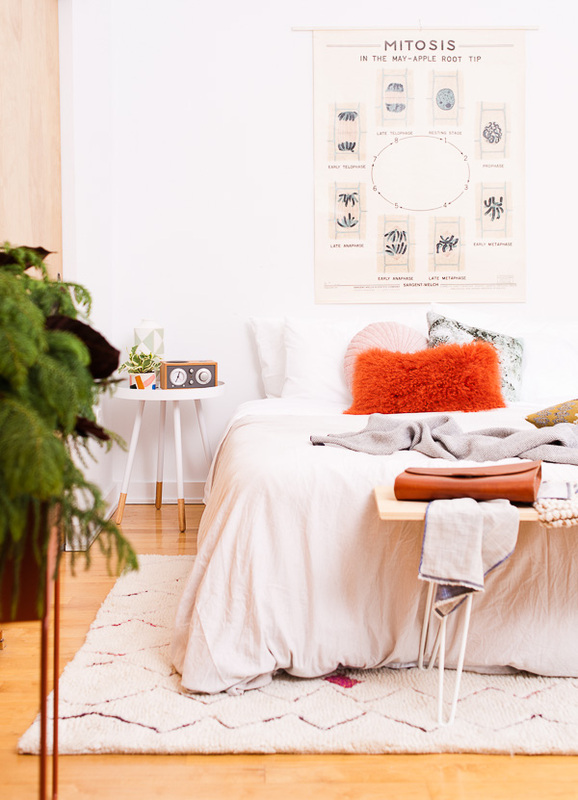 Now, it’s a much more inviting space, that feels more like a guest room that people will actually want to stay in. And when no one is visiting, Jeff and I plan to use it too, for taking cat naps, reading, playing music, etc. 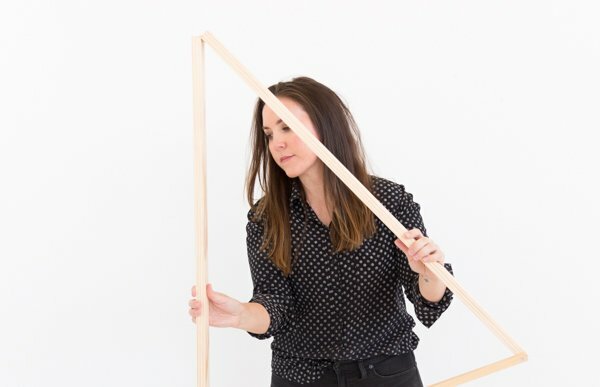 If you’re interested in recreating this look at home, it’s more in reach than you might think. 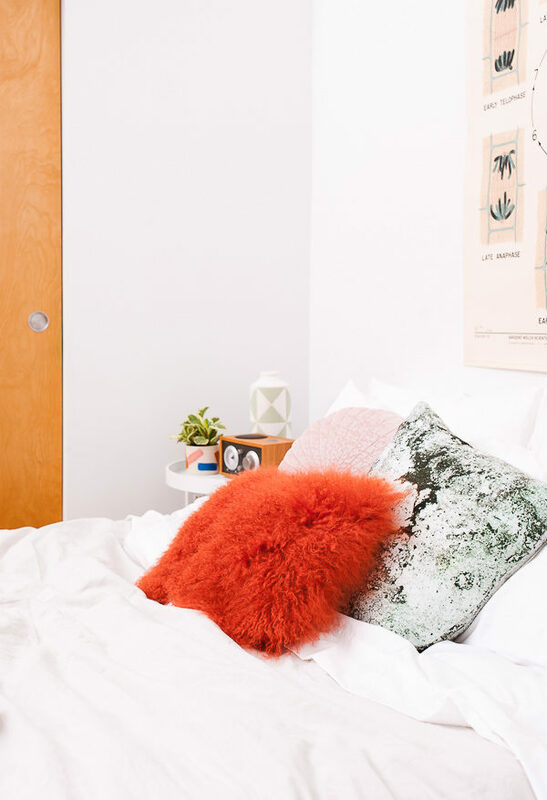 Especially since all of the signature pieces in the new room are from Overstock (so it’s all budget-friendly / affordable), including the nightstands, mirror, pillow, mini Christmas tree, and the rug! 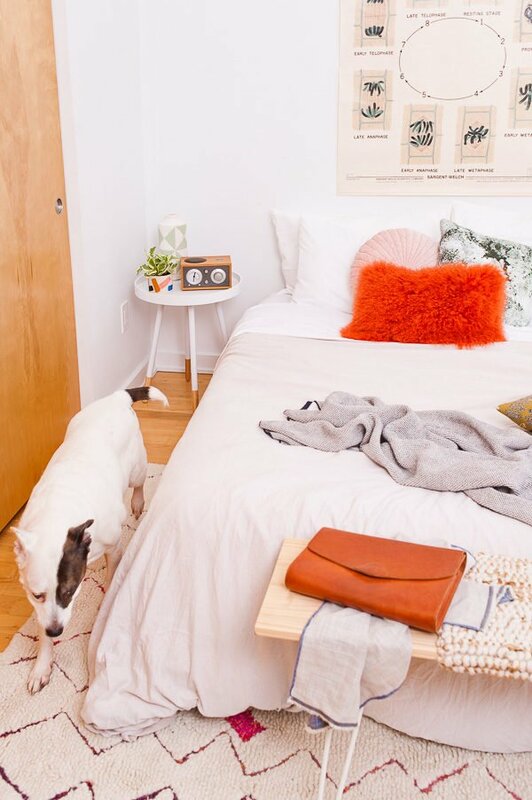 The rug is a handmade Moroccan zig zag shag from nuLOOM ($250 for a 5×8 rug!) and was a nice way to break up the hardwood a little bit and make the space feel more cozy, which can be a challenge with the very high ceilings. 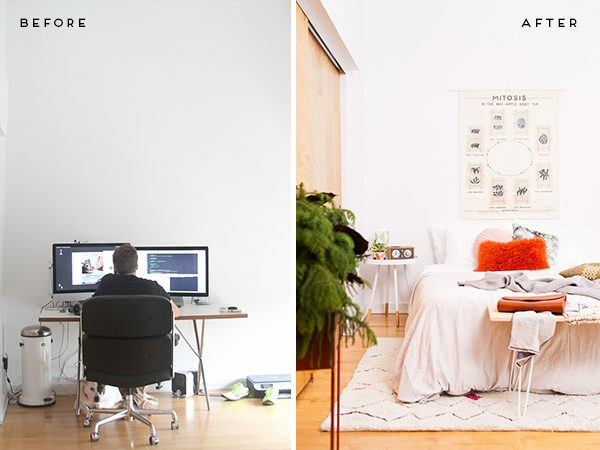 Not that I’m complaining about high ceilings – I love them, don’t get me wrong. I really wanted to have a standing mirror in the guest room, especially since the guest bath only has small(ish) mirror options. So, I went with a leaning mirror from Holly & Martin. Love the minimal shape of this one. 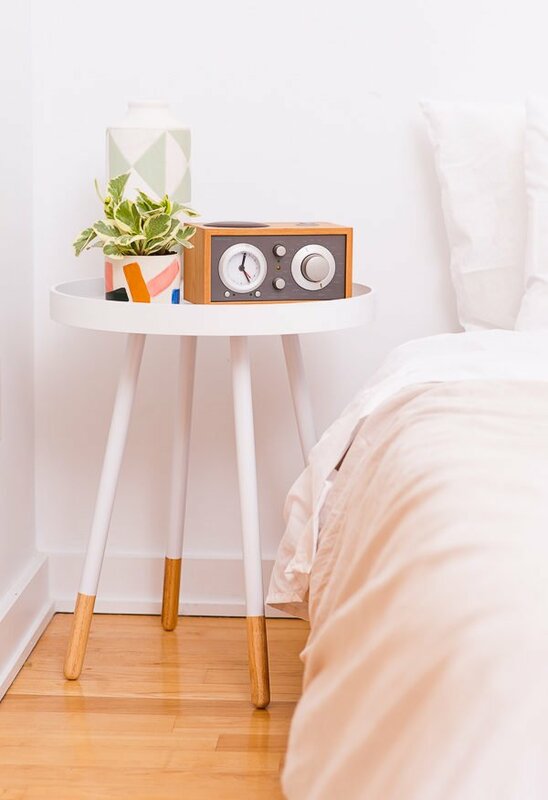 I picked up the mid-century inspired side tables by Mid-Century living for only $40 each! And for that price, you kind of can’t go wrong, so I decided to use them as bedside tables, in leu of typical nightstands. They have lots of other colors too, if you’re interested. 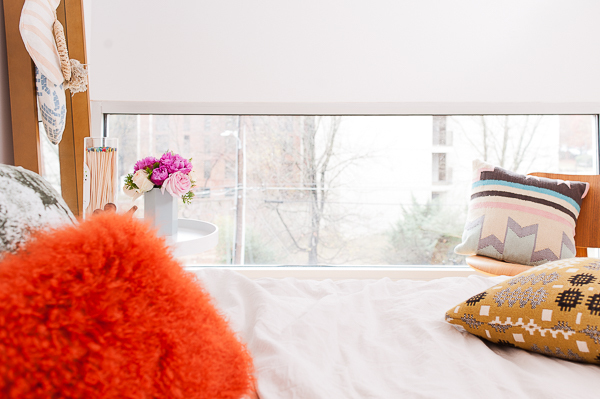 For the most part, we already had the bedding (duvet was something we used to use on our own bed), but I brought in some new pillows and blankets to freshen things up. The faux fur pillow in pumpkin is one of my faves. And the other textiles are just things I’ve picked up over the years. 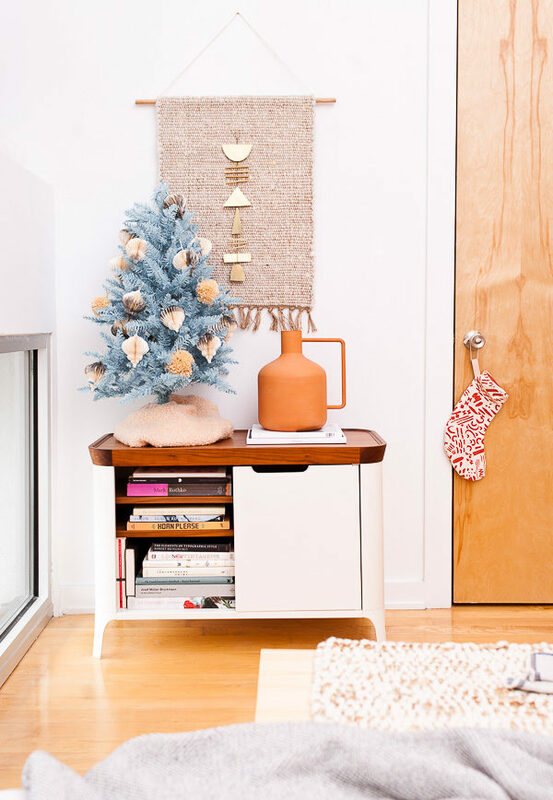 And then there’s my sky blue Christmas tree from Vicker man, as a fun way to tie in the holidays without overpowering the space. Admittedly, I’d been wanting a colorful tree for the house, just for fun, and as much as I love the pink ones, I wanted something that I hadn’t already seen a hundred times. So, sky blue was the winner. 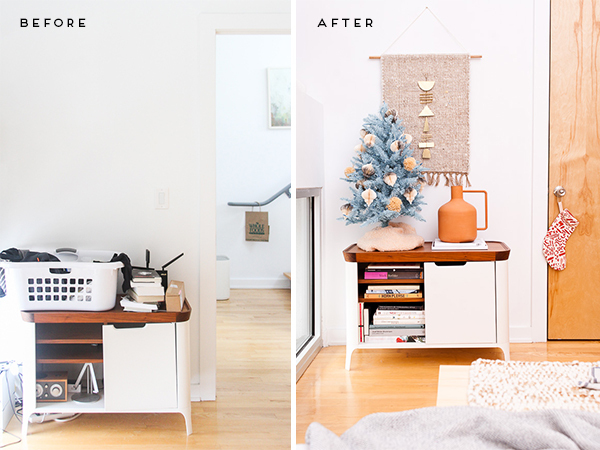 It’s only 3 feet tall, so it makes it super easy to pack back up once the holidays are over. Aside from the tree, I brought in my DIY Christmas stockings (I’ll be sharing the tutorial soon for these) for an extra holiday pop that doesn’t overwhelm the space. They’re hanging from the standing mirror. And speaking of DIY ideas, the weaving you see behind the mini Christmas tree is a project I just recently finished up. Super easy too! It took all of 5 minutes to make. Tutorial here. So what do you think? 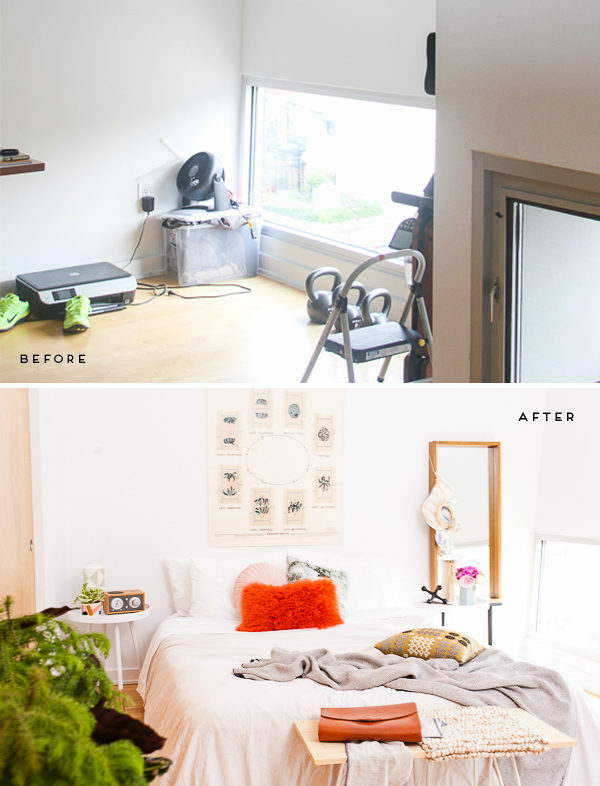 I’d love to hear your thoughts on how my guest room makeover turned out. And also, I’m curious to know how you bring in the holidays to other rooms of your house, like the guest bedroom, etc. Let me know in the comments below. This post is in partnership with Overstock. All opinions are my own. Thanks for supporting the brands that help keep Paper & Stitch running. Thanks so much Jessica. I really appreciate that. I’m booking my return trip to ATL. Haha. Perfect! It will be a lot nicer than when you and Kel stayed here last time. 🙂 Not that it would take much for that to be a possibility. Hahaha. Thanks Pat. Happy to hear that. It’s so bright and beautiful, I totally love it! That white/wood cabinet is to die for! Is it vintage? Thanks Kristin. 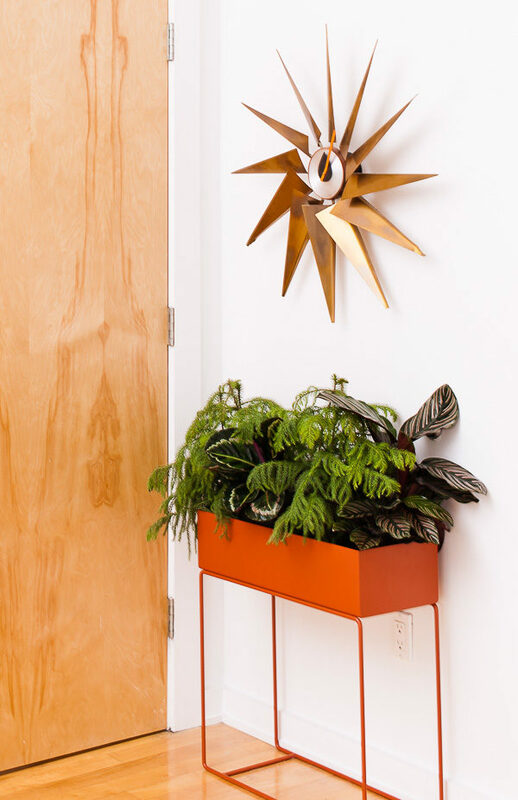 The planter is from Ferm Living. Love it! I get the all organic modern feels and the colors are perfect! Does that white unit with your cute tree on it have a brand? I’m on the hunt for something like that. 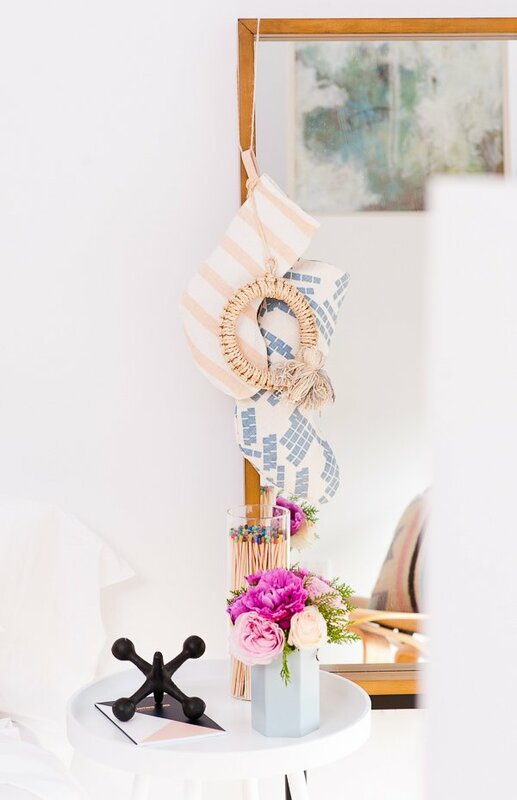 20 Stunning Guest Room Decor Ideas - Frugal Mom Eh! hi! came across your post from domino mag instagram story. 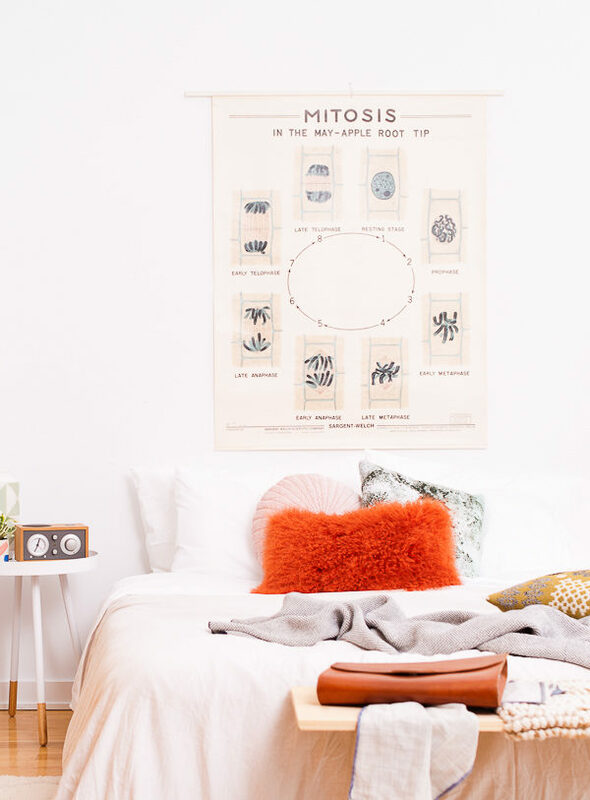 where is your vintage mitosis poster from? i love it! Hi there, this room looks amazing! 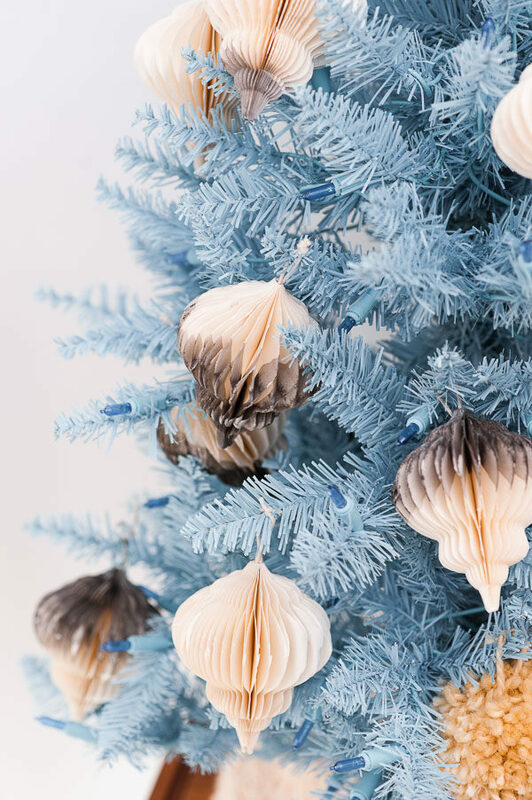 Funny question, where did you get the paper ornaments on your awesome tree?